Open April through October, our Garden Center is a delight for all plant lovers. We offer a broad selection of annuals, perennials, trees, shrubs, and unique evergreens. You will see the difference in our entire plant selection…lots of love and attention yields healthy plants. Starting with a healthy plant is a good way to ensure success. We are happy to offer a wide variety of plants to build a complete butterfly habitat. Our friendly staff is happy to assist with your selection. Come and walk through the gardens even if only to relish the beauty – displays are always evolving with the seasons and provide much inspiration. Many of our perennials and annuals are locally grown on site by our green thumbed staff. You will see the difference in our entire plant selection…lots of love and attention yields healthy plants. Starting with a healthy plant is a good way to ensure success. Miniature Gardens including Terrariums are a fun way to garden for all ages. Explore our offerings in this area and be inspired by our ever changing displays and products. We carry a nice selection of Ittie Bittie houseplants and air plants that are perfect for this application. Kids and audlts enjoy working on these projects together…miniature gardening can be a collaboration and memories are often happily made while creating your own tiny world with those you love. Come and walk through the gardens even if only to relish the beauty – displays are always evolving with seasons and provide much inspiration. 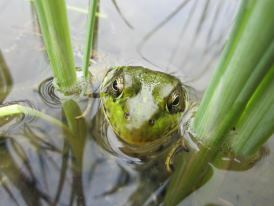 Visit us throughout the spring and summer and you will see many ponds and waterfalls to inspire and enjoy. We offer pond supplies along with years of ponding experience and can assist you in improving or creating your own water feature. A properly constructed and maintained water feature should be simply enjoyed – not constant work. We can help you achieve this with your feature. Certainly, owning a pond is a small hobby. A fountain or a pondless waterfall exhibits a very small amount of maintenance comparatively. Give us a call to set up a time to visit with one of our Pond Techs, Kevin or Sherri for specific technical advice or troubleshooting. 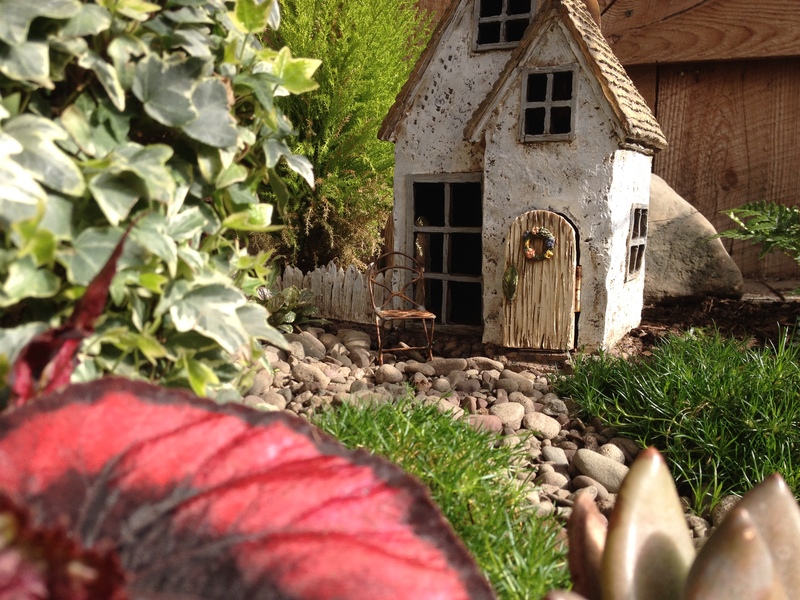 Our village of Fairy Creek is a miniature world designed by our staff to inspire your own creation. Changing seasonally, this display features plantings, houses, and lots of other tiny elements used together to create a small world fit for fairies. 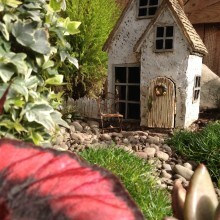 Kids and adults alike enjoy a visit to our magical small village sure to inspire a miniature garden of your own. We carry a complete line of indoor and outdoor tiny plants along with all the accessories you will need to get started on your own miniature gardening adventure. 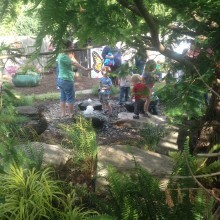 The Kids Garden at Creekside comes alive in the spring when colorful bulbs first show their faces peeking out of the soil. Bubbling fountains are very popular during the hot summer months and small hands cannot resist a dip in the flowing water. 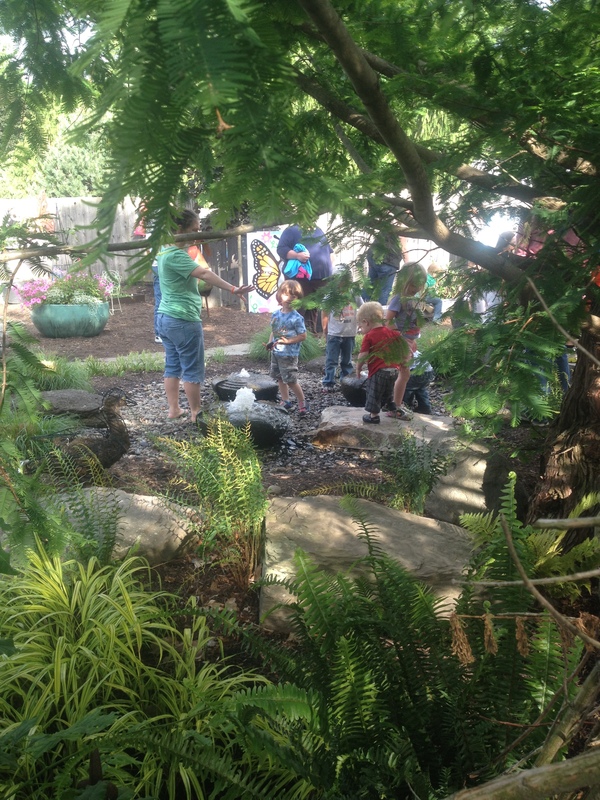 Our small gravel play area is complete with a few shovels and trucks and provides simple entertainment for the little ones. Caterpillar and Butterfly cut outs make great photo opportunities. Benches create refuge for family members to observe priceless interactions with our natural surroundings.